We are pleased to announce the BCRL construction in Skaggs 060B is now complete. 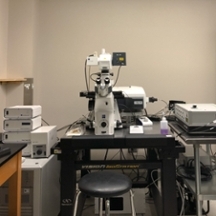 Clients are once again able to use the Zeiss 880 Confocal Imaging Microscope, with PicoQuant upgrade for FCS and FLIM, and the MicroTime 200 Time-Resolved Microscope for FCS, FLIM and single-molecule detection. Because these instruments have been down most of the summer, we are requiring users to complete a free refresher training – to make arrangements, please contact the BCRL Director, Sandy Ross. Once training is complete, the user will be able to schedule time on LabAgenda; users will be charged according to the BCRL fee structure. For further information or if there are questions, please contact Sandy Ross (406-243-4560 or sandy.ross@umontana.edu).